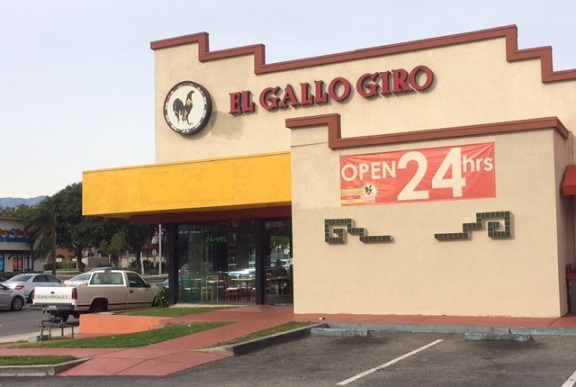 The popular Mexican chain El Gallo Giro has eight locations, all in Southern California, including one in Fontana right off the 10 Freeway. When you exit at Sierra, bear to the right, because you’ll be turning right almost immediately, and the notoriously clogged interchange offers no room for error. I knew the restaurant by reputation, and by sight (the name, by the way, means “Champion Rooster”), but I hadn’t eaten there until recently. 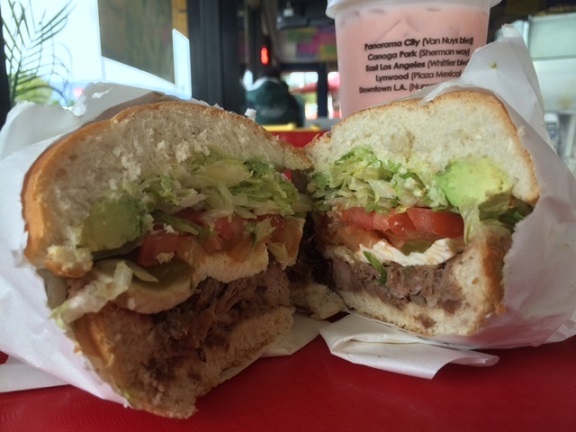 An El Gallo Giro billboard along the 10 on my drive heralded its tortas. It was a surprising sight but one that shows the restaurant is kind of a powerhouse. Open 24/7, the restaurant has its own bakery, with bins of pan dulce on a wall near the cashier. Ordering and seating is fast-food style (in fact, the restaurant is next door to a McDonald’s). But the quality is more In N Out, or better. At the counter, a row of glass containers with a half-dozen aguas frescas are lined up. The menu has tacos, burritos and other items, including breakfast. I got a carnitas torta ($5.89) and a mamey drink ($3.29), made from a Mexican fruit. A few minute later, my number was called over the public address system. I’m not a torta expert, but this was among the best I’ve had. The sandwich was cut in half, revealing layers of filling like a cutaway of the earth’s crust: a smear of refried beans, a slab of pork, queso blanco, tomatoes, lettuce, peppers and avocado, all in a fresh-baked bun. The drink was delicious too. There’s plenty to see here. Tortillas are made from scratch on a rotating griddle where you can watch. Packages of tortillas are ready to be purchased, with condensation visible inside the bag, attesting to their freshness, and the station is decorated with tile. Pork is cooked in a giant kettle in the open kitchen. El Gallo Giro is a good spot and well worth a visit — even though getting back to the freeway afterward is a challenge. 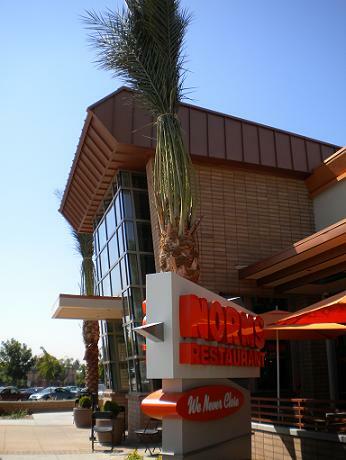 Norms, which opened in Claremont next to the 10 Freeway in August, was the most-anticipated Inland Valley restaurant arrival since Five Guys Burgers in Rancho Cucamonga. All this fuss for a sort of upscale Dennys? This says a lot about the essential working-class character of the valley, as well as the numbers of repatriated Angelenos in our midst, as Norms’ 18 locations are scarce in our part of L.A. County. The 24-hour diner, heralded by a very un-Claremont sign that looms over the freeway, is still busy a month after its opening, so timing your visit carefully is advised. I had breakfast there with a friend recently. At 8 a.m., the restaurant, which has an occupancy of 221 seats, had plenty of empty booths, but by the time we left at 9, every seat was full and there was a line to get one. Ditto with a lunchtime visit a few days later; at 11:45 a.m., 25 people were waiting to be seated and there was a line at the cashier to pay. By 1 p.m., when we left, the crowd was thinning out and the pace slowing. It’s a comfortable, coffee shop vibe, with browns and oranges in the color scheme, plush booths, counter seating and tiled walls. 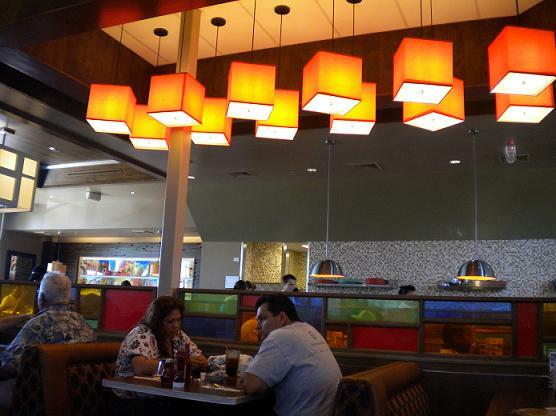 One friend said the interior, with its high ceilings, hanging orange lamps and expanse of windows, reminded him of the old Henry’s drive-in. There’s a surprising amount of outdoor seating as well, wrapping halfway around the building. 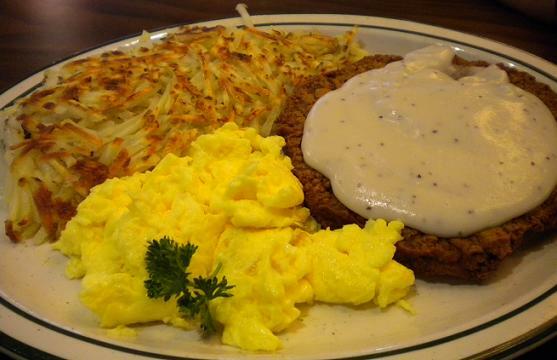 At breakfast, I had the Jump Start ($4.99), with eggs, bacon and toast. It was what you’d expect. For an extra buck I could’ve had the Bigger Better Breakfast, which comes with eggs, pancakes, ham, bacon and (not or) sausage. That’s a lotta meat. Coffee, at $2, was a little steep, my friend said, but Norms is making a fuss about the quality of its coffee, and refills were offered every few minutes. That friend’s verdict: “The food’s pretty good. Everybody’s nice and friendly. They come by and ask how you’re doing.” Of the crowd, he said: “You wouldn’t know there was a problem with the economy.” He also observed that the diners didn’t look like Claremont people, being working-class types and retirees. I’m looking forward to dinner there sometime, and maybe to a middle-of-the-night visit too, if only I could stop sleeping soundly and induce insomnia. The interior (cheerful, bright, with an inviting bakery case and country clutter-type decor) and the menu (pancakes, sandwiches, salads, homey dinner entrees, pies, muffins) remind me of Polly’s Bakery Cafe, a SoCal chain I like. 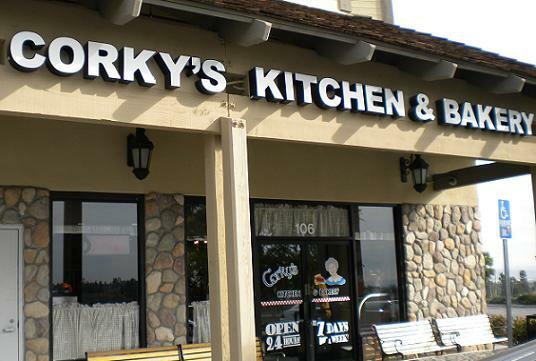 Corky’s is ambitious: It’s open an astonishing 24 hours a day. At least until it sinks in with the owners that no one in Rancho Cucamonga is up past 8:45 p.m.
At any rate, I ordered my baseline sandwich, a tuna melt on sourdough, which proved better than average. The sandwich came with a dinner salad that showed some effort. 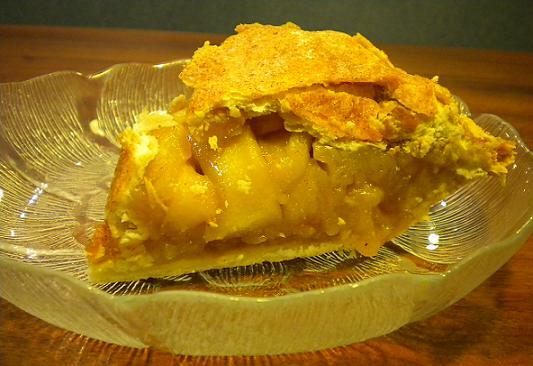 As Corky’s had a half-dozen pies on hand, I tried a slice of Dutch apple. It was practically a meal in itself, bursting with tart apples. Corky’s is pretty far out of my way, and yet I can see myself going back on a long lunch hour sometime. Unless the mood strikes me at 3 a.m.
UPDATE: Corky’s, I’ve since learned, was opened by Mike and Jennifer Towles after closing their Tole House Cafe in the same shopping center. It’s named for Mike’s late grandmother.